Place the rice in a medium sized heavy bottomed pot (set aside your biggest pot for the soup). Pour in 2 cups of water, cover and bring to a boil. Turn down the heat as low as it will go and simmer, covered for 45 minutes, or until all the liquid has evaporated. Meanwhile, melt the butter in the big pot over medium heat. Add the onions and cool until translucent, 8-10 minutes. Add the spices, stir to coat the onions, and cook for 1 minute. Add the tomatoes and 6 cups of water, cover, and bring to a boil. Turn to medium low and simmer, covered, until everything is cooked down. I just cooked it until the rice was almost done. Puree with a hand blender, then stir in the coconut milk. While the rice is cooking, place the almonds in a dry skillet and heat on medium until browned and fragrant, stirring occasionally. 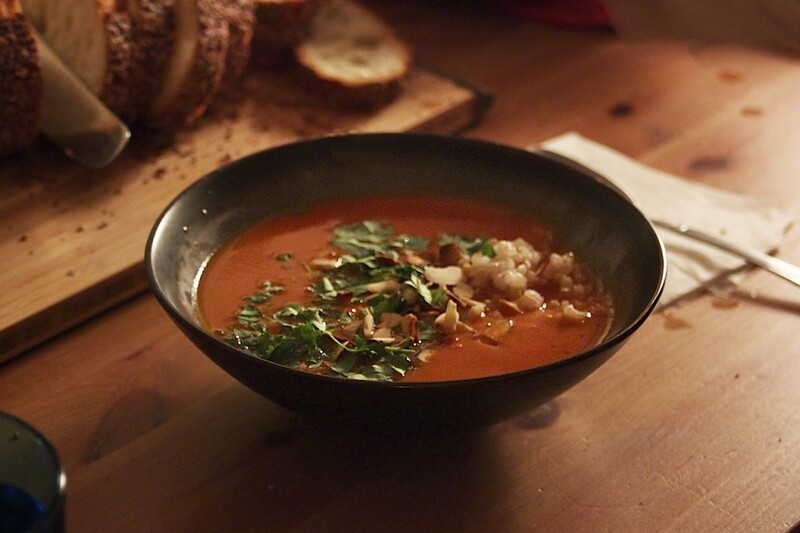 Serve soup with a scoop of rice, some toasted almonds and a sprinkling of cilantro. For additional details on how to make this recipe, please visit the site of our generous contributor greensandseeds.